The Columbian coat of arms consists solely of straight lines and angles, symbolizing the determination, tenacity, firmness and courage that the Order's founders had to demonstrate in the face of difficulties to surmount, problems to solve to defend their faith and their rights in a milieu ill-suited to the growth of their Movement. The Columbian Coat of Arms contains three symbolic elements: the sword, the anchor and the battle axe, recalling the noble and illustrious deeds of the Order's founders. The sword and the anchor, placed one over the other, form a sort of "X" or St Andrew's cross. The sword symbolizes honor, distinction, bravery and courage. The anchor, an instrument designed to hold a ship in place, represents that which attaches, stops, consolidates and stabilizes. The battle axe, placed on the shield, symbolizes action taken to overcome obstacles or ambushes on the road to accomplishing one's objectives. The bundle represents the solid grouping of people come together to realize a common ideal under the guidance of a recognized leader. It symbolizes teamwork, the strength inherent in unity and fraternity. The helmet, placed on the upper part of the Coat of Arms represents rank or degree of nobility. On the coat of arms of a warrior it is the noblest and principal ornament. The little white triangle, above the helmet and pointing upward, symbolizes the flame which lights and guides. The blue (azure), represents the sky, that is, God who watches over the world. It is the symbol of hope, peace, and confidence. The white (silver) is innocence, frankness and purity of intention. The yellow (gold) denotes indestructible goods, the richness that comes with hard work. The red symbolizes giving of one's self, courage, valor and heroism in the fight for one's faith, one's language and one's rights. The Fourth Degree emblem is made up of three distinct symbols which represent the three persons of the Holy Trinity. The cross represents God the Son, redeemer of all men. The globe represents God the Father, creator of the universe and all things visible and invisible. The Dove represents God the Holy Spirit, sanctifier of the world, breath of life and inspiration for all men. These three symbols remind the Knights that they have the faith and belief in the Trinity. Blue (azure) symbolic of innocence. White (silver) is the symbol of integrity. Yellow (gold) is intended as the symbol for the riches acquired through hard work. Red stands for courage, valor and giving of one's self. The colors emphasize the basic principle of the Fourth Degree: PATRIOTISM. The Knights of Columbus Council 5779 is a brotherhood of Catholic gentlemen committed to the virtues of charity, unity, fraternity, and patriotism. 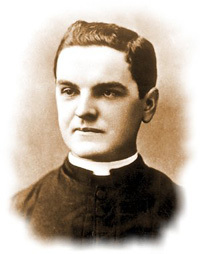 Central to our mission is the defense of the Catholic Church and its Priests. 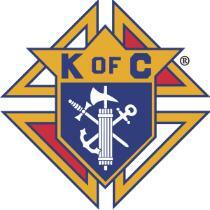 The Order of the Knights of Columbus is consecrated to the Blessed Virgin Mary. We are unequivocal in our loyalty to the Pope and firmly committed to the protection of all human life, from conception to natural death, and to the preservation and defense of the family. It was on these virtues that our Order was founded over a century ago and we remain true to them today. Imagine being part of an organization that fills your heart and your mind with the joy of giving to others and the feeling that comes with making a difference! Knights are Catholic men, 18 years of age and older, who are committed to making their community a better place while supporting their Church. Being a Knight si more than camaraderie; it is supporting your local Catholic Church while enhancing your own faith. It is about protecting and enhancing your own family life. Come and see what we are all about! This web site will tell you about Knights today and what we do, and this site will give you answers to questions you may have about the Knights.